Cycling enthusiasts will spark spirited conversation with this illustrated bike path laptop case. 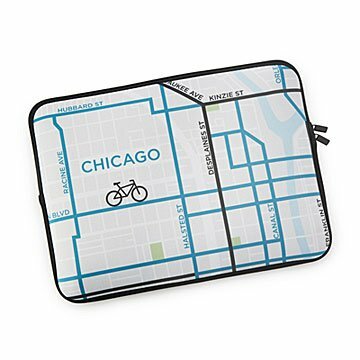 Biking enthusiasts will spark spirited conversation with this laptop case, which features a colorful map inspired by popular sections of bike paths of your favorite city. Black lines represent protected paths while blue lines represent shared ones. Available in three different sizes, it's made of long-lasting neoprene for the utmost durability and protection. You'll carry your favorite two-wheeling route with you everywhere you go. Imported case, decorated in Phoenix, Arizona. Cities are constantly changing, which means bike paths are, too! So please note these illustrations are inspired interpretations of those paths. Click to view all available cities and sizes. Check out our coordinating City Bike Map Phone Cases here! Click to view all available sizes. This is a made-to-order item. If you order today your item will ship no later than 5/3/2019.